The new home of the College of Education will create unprecedented instructional opportunities and also be a structure that unifies the south end of campus. The 19-classroom facility, which is on target to open in December, received a ceremonial topping off by its Pono Construction crew on Wednesday morning, Sept. 15. GCU administration treated the workers to pizza on the east end of the second level. 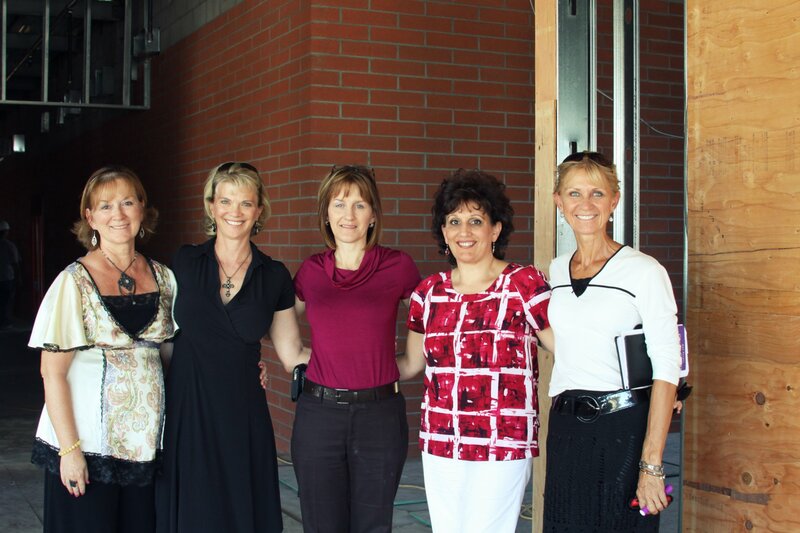 COE staff tour the office space in their new building. The college primarily has used the Fleming and Wallace buildings for its classes — and has even used the conference room of its own modest administration building. The building has several interesting features, as explained by architect Tom Reilly of the Tempe firm Architekton. Each corridor will have a “computer bar” for student use, and there will be alcove space for impromptu meetings. There will be three classrooms capable of opening into double rooms, and two group-study rooms on the west end will face out on the Promenade. “There’s a relationship with the Promenade as a people space and an active space,” said Reilly, noting that the challenge was to make the new building fit in complementary fashion between the Library and Fleming. Dr. Cindy Knott signs the final beam to top the COE building. Restrooms have been positioned on the east side to better serve the open space leading to the Event Center, which is under construction and will be ready in the fall of 2011. A video board on the COE building’s east side will have the ability to show movies or sports telecasts to those gathered on the paseo. “A big part of this building is its eastern face,” Reilly said. From the Promenade, a pedestrian is able to see all the way down the hallway of the COE building to the College of Nursing and Health Sciences building, which is almost perfectly framed by the hallway. Reilly praised Pono, which has had a crew of several dozen on the job at all times and an estimated 300 workers total. Pono also built Canyon Hall, the new dormitory on campus. I was honored to have been at the ceremony! This facility will be a marvel for years and years.